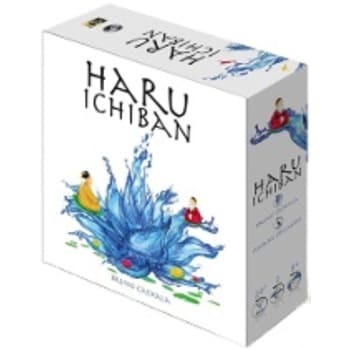 Haru Ichiban in Japanese means "The first spring wind". Two garden apprentices are competing for the coveted title of Imperial Gardener. They will have to demonstrate their skills and take advantage of this first spring wind to help their lilies bloom. The Imperial Gardener will create the most harmonious combinations. As soon as a gardener creates a specific pattern with blossoms of his color, he scores points. 1 point for a 2x2 square, 2 points for a horizontal or vertical row of four blossoms, 3 points for a diagonal row of four blossoms, and 5 points for a row of five blossoms. 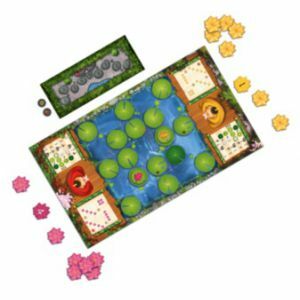 As soon as a gardener has five or more points, the game ends and he wins!